At Shollenberger & Januzzi, our attorneys are committed to helping the victims of negligence on the highways, on the job or in the hospital. If you need advice about your legal rights concerning a personal injury or wrongful death claim, contact our office in Enola for a free consultation. We understand that a serious accident can cause financial, emotional and practical problems not only for the victim but for an entire family. That's why we work just as hard to help you through your recovery as we do to collect the maximum compensation possible on your legal claims. Because we know you're counting on us, we make sure we're easy to reach. Our goal is to return every client phone call the same day it comes in. Our law firm's commitment to close involvement with our clients not only improves the quality of our service — it also helps us achieve better results on your behalf. 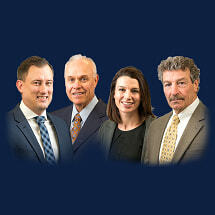 Our law firm was established in 1997 when Timothy Shollenberger and Karl Januzzi formed the current partnership. Both attorneys are known throughout Pennasylvania as accomplished trial lawyers, effective negotiators and authorities on auto insurance law. Mr. Shollenberger is a past president of the Pennsylvania Trial Lawyers Association, now known as the Pennsylvania Association for Justice. He has gained membership to the Elite Lawyers in America and was selected as one of the top 100 trial lawyers in the state of Pennsylvania by the National Trial Lawyers Association. The firm's highly trained staff includes three full-time paralegals and other staff fully dedicated to serving your needs. Our adoption of high-tech data management, client file and research systems means more efficient and reliable work for you. For a free consultation about legal problems ranging from car accidents, workers' compensation to medical malpractice, contact an experienced attorney at Shollenberger & Januzzi in Enola.